I’m not all to sure how to spell that word, and neither is the internet. Whatever the exact order of those letters, now that you’ve found yourself this side of the window, allow me to regale you somewhat with another blog post. 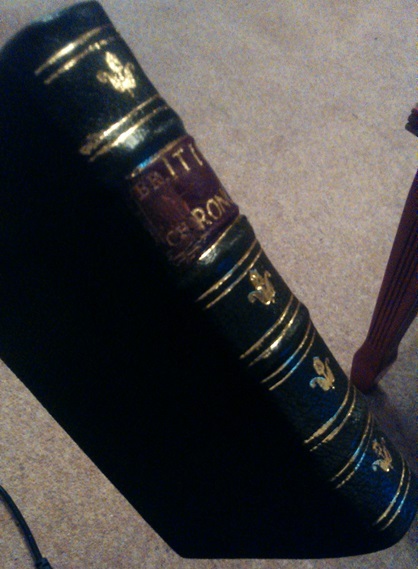 I have just finished restoring my copy of The British Chronologer, a wonderful little vademecum of history printed as a single edition in 1720. 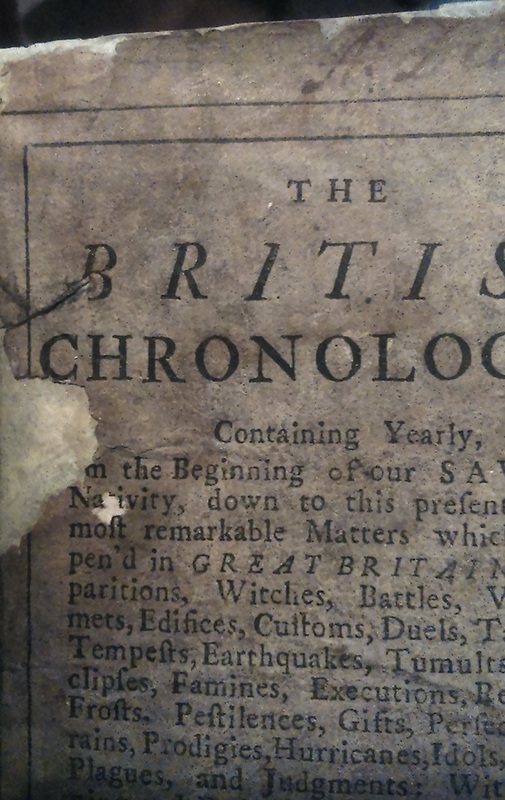 It lists every year between AD 1 and 1720 (although someone has taken offence to the last few years in my copy, and torn them out). Next to each year it gives notable events, be they wars, births, deaths, great storms, or strange occurrences – it’s a rather fascinating remnant that adds a particularly odd early-18th century skew on British history. I’d basically read it cover to cover* before I’d even started repairing it. The new binding may be a little bit of an enigma to any future researchers of its owners, since I had a spare 18th century board I’d got along with a bunch of books I’d bought about two years ago that fitted this Chronologer perfectly. So that is now a part of the new binding, complete with the board’s book plate that never belonged to the Chronologer at all. *Technically, endpaper to endpaper, since the book when I bought it in fact had no covers. I’ve had about as much time to blog recently as I’ve had to travel to Egypt, and, because of the concerning lack of time for either, neither eventuality has happened. Of course, I hadn’t planned to go to Egypt anyway, so that might explain why I’m not sat on top of the Sphynx right now. Anyway, what is it that has kept me from the welcome pursuits of blogging, and what does it have to do with the title of this post? Well – with the rather remote chance of people actually buying my History of Danbury Place having come true, I thought I’d have a go at writing the history of another surprisingly little-known and also sadly lost manor house of Essex. This time it’s the once-monastic settlement and later manor house of Bicknacre Priory, a place that I was fortunate enough to be a part of the team doing an archaeological dig there about five years ago. I’ve already had a bit of luck digging out a completely unknown drawing of the manor, which had been lost in the archives of the Society of Antiquaries since it was presented to them at the end of the 18th century. And, with their very kind permission, I have been allowed to use it within an eBook without charge so long as I myself do not charge for the eBook. At some point soon, then, kind reader, I hope you’ll see on this blog a complete history of Bicknacre Priory, from the original hermitage, with each Abbot, Owner, and remarkable episode in its existence until the present time. I’ve also been bookbinding a lot, so I hope there’ll be another post on that soon too. Farewell for now, dearest Kidderminster. You’re very tricky to defeat in a standard siege scenario, aren’t you? Allow me, well fortified reader, to produce these honest lines, rather indistinguishable from the usual outpouring of tuneless letters I pleasantly bash away upon. They seemed, however, somewhat suited to the moment. Alone at last; lay down your head. Have all and gone; lay down at last. War and crimson have no ends. Rest, those times are now forgot. Where is he now? Where does he lay? So rest, since days of blood are through. That peaceful lot where you reside. At peace asleep where poppies grow.